"Boasts a stainless steel, insulated body and comfortable exterior." "This thermos is designed to be durable and fits in any bag." 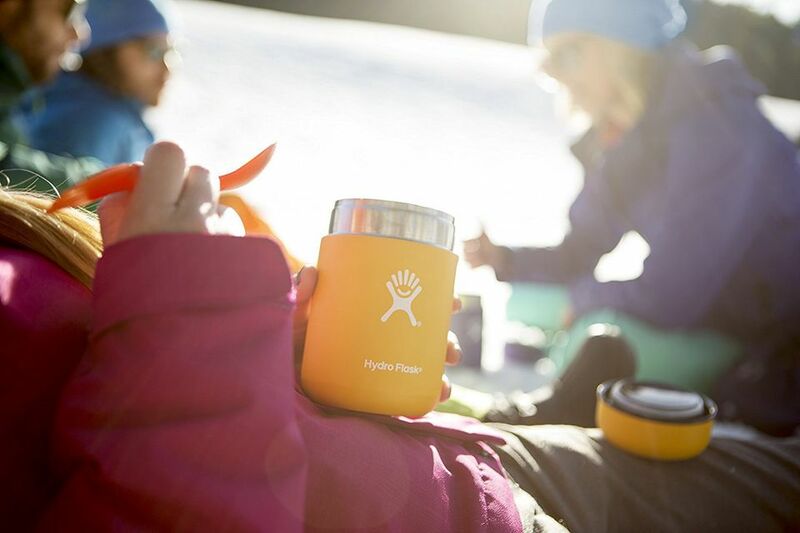 "Affordable, triple wall-insulated thermos with 17 oz. capacity." "This stackable set of containers is convenient and stylish." "This insulated metal jar holds 16 ounces and keeps food piping hot." "The Foogoo is perfect for kids because it's spill-proof and durable." "Features five small compartments in one latching compartment." "Fits around bottles and cans to keep them ice cold." When you search for the optimal thermos, you probably have a few criteria in mind, such as affordability, durability, compactness, effectiveness, and design. This simple, yet well-made and popular food thermos is sure to fit the bill and will be a purchase that anyone will enjoy. The massively popular Thermos Brand Funtainer features a stainless steel, insulated body and comfortable exterior. This inexpensive 10-ounce food thermos is compact and comes in vibrant colors. It keeps food cold for seven hours and hot for five. Possibly more fun than the Funtainer is the Hydro Flask Food Flask thermos. This brand’s well-known colorful, matte metal—available in several colors including lava, mint, and mango—insulates your food in a stylish container. You can get your Food Flask in either a 12- or 18-ounce size. This thermos is designed to be durable and is small enough for nearly any bag. If you want to keep your meals extra hot without breaking the bank, the MIRA Stainless Steel Lunch Thermos does the trick quite nicely. Affordable without sacrificing quality, this stainless steel, triple wall-insulated thermos boasts a 17-ounce capacity, so it’s perfect for holding soups, hot lunches, or snacks of varying sizes—and it’ll keep your food hot for up to five hours, and cold for up to ten hours. This premium, durable MIRA Lunch thermos is also free of lead, BPA, phthalates, and PVC, and it’s very easy to clean thanks to its wide mouth. Customers report that it’s the “perfect thermos for on the go” use. There are few lunch options better for both kids and adults than the Ospard Stainless Steel Insulated Lunch Box. This stackable set of containers is convenient and stylish. The compact tower looks like one traditional, large thermos, but it is actually three individual containers put together (they are also available as single or two stackable insulated containers). The Ospard containers can keep food warm or cold in stylish pastel green, blue, or pink designs. Along with their appealing exterior, the interior of these containers is made of an easy-to-clean stainless steel. The leakproof containers total 43 ounces of storage. Whether your job includes unpredictable meetings in the office or being exposed to the elements for hours on end, the most important thing about your soup lunch is that it is still hot when you want it. The Thermos brand Stainless King Food Jar can do just that. This insulated metal jar holds 16 ounces of soup—or any liquid—and will keep your food piping hot without the container ever being warm-to-the-touch. Available in blue, red, stainless steel, and black, the Stainless King includes a built-in spoon and a lid that works well as a bowl. The Thermos Foogoo food jar provides all of the functionality of a typical thermos, but with the colorful flair and rubber edges that kids will love. The BPA-free container is made specifically for kids—it won’t sweat in the backpack, it won’t spill, and it’s durable. Resistant to scratches and slips, this food jar can even go in the dishwasher. The stainless steel, insulated Thermos-brand container includes a rubber-cover bottom and lid that comes in fun colors like blue and yellow, watermelon and green, or purple and blue, and are also offered in a few designs. Perfect for hot or cold items, the Foogoo can keep soup warm for 5 hours and fruit cold for 7 hours—great for lunch or after-school activities. For kids (as well as adults), the best thermos option for lunch is an insulated bento box. The highly rated and popular leakproof bento box from Bentgo is a great option. Featuring five small compartments in one latching compartment, parents can easily store a balanced lunch without worrying about different temperature food, flavor mixing, or spills. This container includes rubber edges for durability reducing the damage from an inevitable drop in the school cafeteria. This Bento Kids product also comes with a two-year warranty and an eBook with 30 kid-friendly recipes. The company also donates some proceeds to Feed the Children. This bento box thermos is dishwasher- and microwave-safe. If you like to pair your meal on-the-go with a cold drink, then this thermos is for you. The Magnum Solace is a specially designed thermos for cans or bottles to keep your beverage cold. If you love to have a soda or seltzer with lunch every day, simply place it in this effective thermos in the morning and grab it hours later to find your canned drink still has a chill. Of course, the Magnum solace comes in a variety of colors and a stylish, minimalist design.